Hörmann commercial doors are built to last. They are available in a wide range of styles, sizes and design options. Sophisticated engineering and state-of-the-art manufacturing provide the basis for durable, reliable and long-lasting quality products. Hörmann H-425U offers 1¾” thick two sided steel sections and 100% CFC-free polyurethane foam core insulation for maximum protection against the elements. (R-value 16.1) Manufactured to the highest quality standards in the industry, all H-425U doors come with Hörmann exclusive FingerGuard™ pinch resistant section joints. Environmentally friendly polyurethane foam core is injected between 25 gauge galvanized steel sheets front and back. This provides maximum insulation for substantial energy savings and ultimate panel stability for extremely quiet door operation. Our renowned Preventative Maintenance Program. Thoroughly-trained, expert technicians who are available at a moment’s notice. We’re fully-insured, so you can enjoy a worry-free installation and repair process. 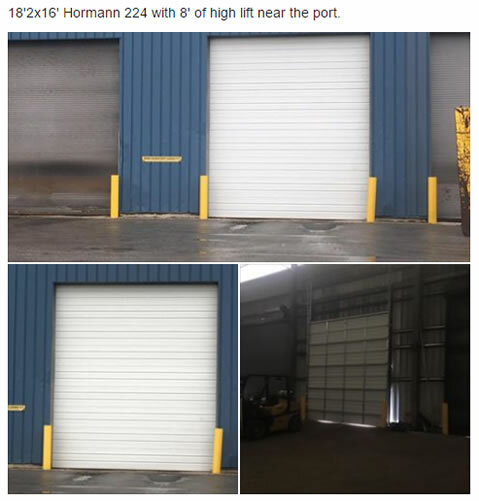 The commercial overhead doors and products we install and repair are performance and safety-tested; if the industrial doors you use were installed by Diamond State Door, you can rest assured they are durable, reliable, and backed by our top notch service and repair program. We offer a comprehensive selection of industrial and commercial doors, products and accessories. Exposure to the elements and rigorous daily demands of business can take a toll on overhead door systems. Don’t let your business be shut down by unexpected door or opener malfunctions! We work with you to create a preventative maintenance program to keep you operating smoothly and save you thousands of dollars in major repair costs. Call us today and ask for a FREE Consultation for your preventive maintenance program.